Mobile SSH & Telnet for BlackBerry | BlackBerry Blast! 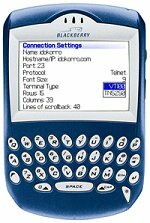 Idokorro Mobile SSH is a Telnet and SSH client for BlackBerry that allows you to wirelessly access and manage network devices including Unix, Linux, AS/400, mainframes, routers, and switches. If you're an administrator who wants to minimize downtime or access a mission-critical application while on-the-go, Mobile SSH provides a proven, flexible, and secure wireless solution. Mobile SSH can be used to connect to servers on the Internet using TCP/IP, or with a BlackBerry Enterprise Server to allow secure connections to servers inside your network firewall.